Make money now by recommending our event! As a partner or affiliate you will receive a commission of up to 20% on ticket purchases from users to whom you have recommended our website. example calculation: Through your link, several tickets were purchased, generating a turnover of 5,000 EUR. In this case your commission would be 1.000 EUR! Register now as an affiliate! © 2018 Bluhmberg Corporation GmbH All rights reserved. Сообщите нам какой язык для синхронного перевода Вам необходим и является решающим фактором при покупке билета на семинар. Мы рассмотрим общее количество регистраций и сообщим вам, если перевод на ваш язык сможет быть включен в программу. Tell us which language you need for simultaneous interpretation and if that is the decisive factor for you when buying a ticket for the seminar. We will review the number of registrations and tell you if we can include translation into your language in the program. 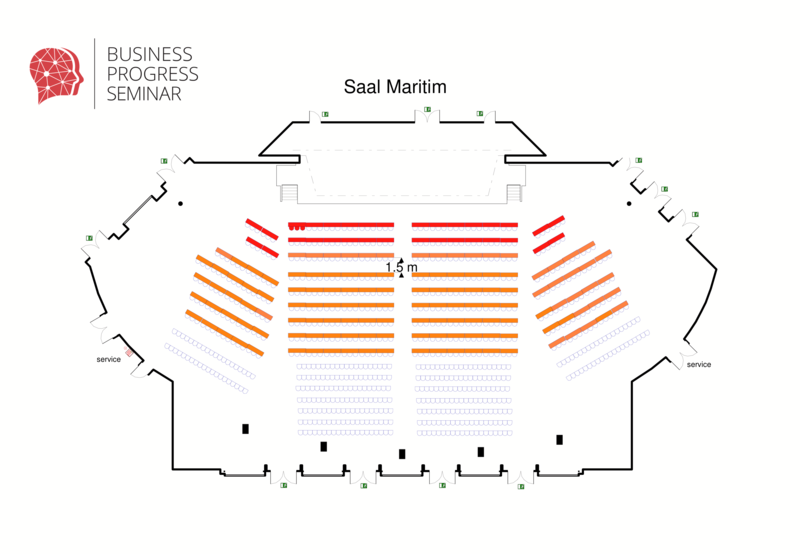 Informieren Sie uns, für welche Sprache Sie eine Simultanübersetzung benötigen und wenn dies der entscheidende Faktor für Ihre Teilnahme am Business Progress Seminar ist. Wird werden alle Anfragen individuell bearbeiten und teilen Ihnen mit, ob eine zusätzliche Sprache in das Programm mit aufgenommen werden kann. Vielen Dank. Schicken Sie Ihr Team auf das “High Performance Selling” Seminar am ersten Tag und verbringen Sie persönlich den zweiten Tag mit Brian Tracy. Bewerben Sie sich jetzt für eins der limitierten Tickets. Aufgrund der hohen Bewerberzahl wird jede Anfrage individuell bearbeitet. Wir setzen uns mit Ihnen in Verbindung! "Leadership in the 21st Century"? Ihre Fähigkeit, sich selbst und andere zu Höchstleistungen zu bringen, ist die wichtigste Fähigkeit in jedem Unternehmen oder einer Organisation. In diesem effizienten, praktischen eintägigen Seminar lernen Sie einige der effektivsten Führungsstrategien kennen. и провести лично только второй день на мощном семинаре по лидерству с Брайном Трейси. Из-за большого количества претендентов каждый запрос обрабатывается индивидуально. Сделайте предварительную регистрацию уже сейчас. Мы свяжемся с вами! Ваша способность привести себя и других к максимальной производительности - это самый важный навык в любом бизнесе или организации. Познакомьтесь с некоторыми из наиболее эффективных стратегий управления в этом эффективном, практическом однодневном семинаре. Сделайте предварительную регистрацию уже сейчас, чтобы забронировать место! Мы свяжемся с вами сразу как только группа будет набрана. 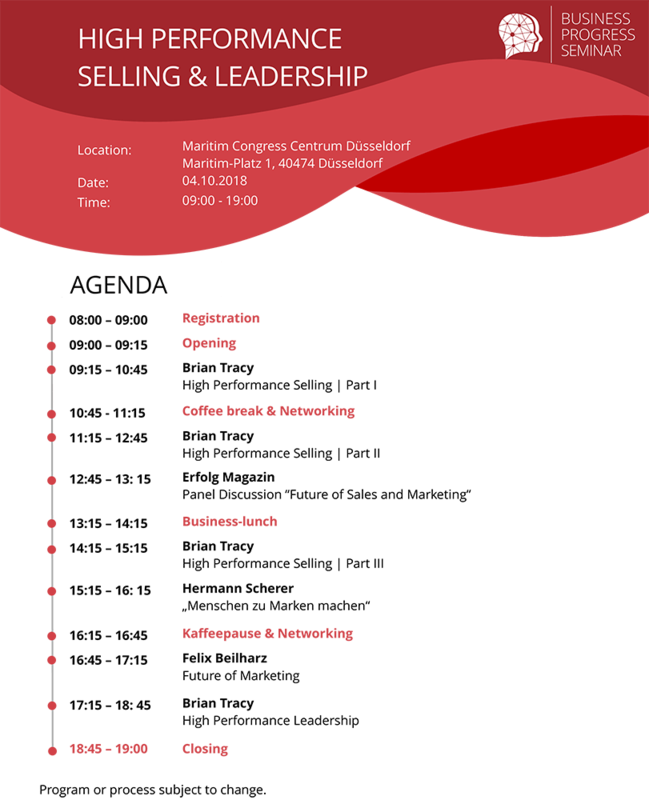 Send your team to the "High Performance Selling" seminar on the first day and personally spend the second day with Brian Tracy. Apply now for one of the limited tickets. Due to the high number of applicants, each request is processed individually. We will contact you! Your ability to lead, manage, guide and direct yourself and others is the most important skill in society, and in any business or organization. In this powerful, practical one-day seminar, you will learn some of the most effective strategies of leadership practiced by the top executives worldwide. Вы хотите быть частью нашей истории и стать нашим спонсором или партнером? Мы будем рады поговорить с Вами об этом. Пожалуйста, заполните форму и мы свяжемся с Вами. Wollen Sie Teil unserer Geschichte sein und unser Sponsor/Partner werden? Wir würden uns freuen, mit Ihnen darüber zu sprechen. Bitte füllen Sie das Formular aus und wir melden uns bei Ihnen. Do you wish to be a part of our history and become our sponsor or partner? We will be very glad to discuss it if you. Please fill the form and we will contact you.